I usually go through these mood phases, wanting to eat junk food, only pasta or chatpata chaats etc. I cannot for some odd reason stick to eating the same type of food every single day. So I am back to my ‘want to eat salad’ mood. But that doesn’t mean I am satisfied with just a tomato. cucumber and carrot chopped and mixed with lettuce. It has to be different. I also don’t like the ready salad dressings so make my own. What are the advantages of eating salad? You may say they are healthy. Yes they are but along with that there are so many other advantages.Salads are nutritious, help you adopt a healthier lifestyle, helps you eat several servings of vegetables and fruits.Salads help to increase fiber and reduce cholesterol levels. A salad before your main meal gives you the feeling of fullness. This helps prevents overeating or bingeing.However, stay clear of fatty creamy dressings and when you use add-ons like meat, cheese, nuts don’t use too much. A little helps to make the salad more interesting and tasty. 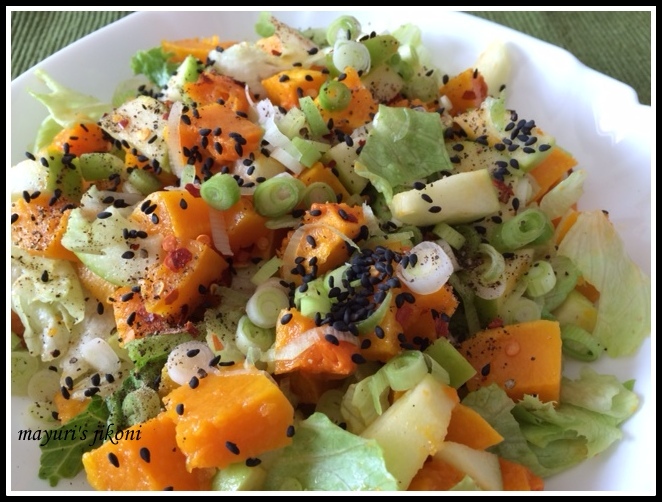 So today I made a butternut squash salad. A few days ago I wanted to buy a small butternut squash but couldn’t find a small one. Bought the big one and used half for the salad and the rest made it into a puree. The slight sweetness of the butternut squash and the sourness of the green apple is a perfect balance. The salad is a stomach filler and healthy. Try the recipe and add whatever other ingredients you want to. Do you enjoy eating salads? Mix butternut squash with olive oil and half the amount of salt. Roast in the oven for 15 minutes or until done. Let the roasted butternut squash cool down completely. In the meantime, cut the apple into cubes. Roast the sesame seeds and let it cool. Add lettuce leaves, torn into bite size or the spinach to the apple. Add the chopped spring onion and the butternut squash. Mix in the remaining salt, pepper, chilli flakes, sesame seeds and lemon juice. I didn’t make a separate dressing as I didn’t want to add extra oil to the salad. You may use a dressing of your choice. Can use normal apple instead of the green one. Add roasted sunflower or pumpkin seeds instead of sesame seeds. I love butternut squash in a salad. It adds so much flavour without much more extra calories. Nice and healthy salad .. but right now we are in winter and I am enjoying hot soups.. I will save it for summer. I somehow cannot eat fruits and salads in winter.